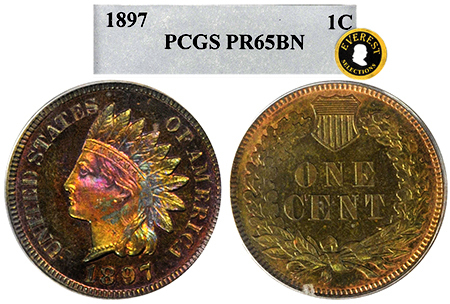 Here’s a rare Indian Cent with MONSTER color and MONSTEReye-appeal! I am so excited to be able to offer this gorgeously toned 1897 Indian Proof! The obverse is 100% covered in the most amazing canary-yellow, emerald green, and hot-pink hues that really POP off of the BN surfaces! The color is bright and bounces off the fields with stunning vibrance! 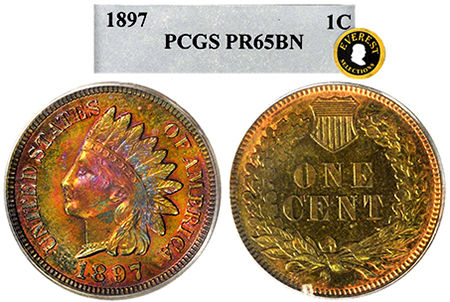 The eye-appeal of this 1897 is mesmerizing and rare with such stellar toning! Over 100 years old and looks like it was just made yesterday!